The Card Grotto: Bah Hum-Pug! 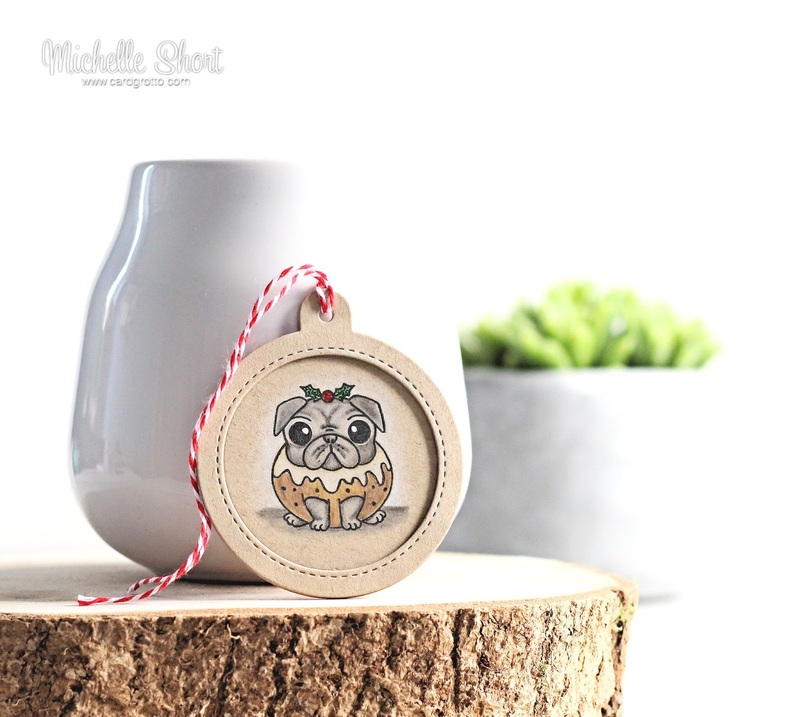 Hello there, due to popular demand Clearly Besotted have released their Bah Hum-Pug stamp set. Such a cute set with lots of pugs in their different poses and outfits. Since Clearly Besotted are on a break at the moment, the set is currently exclusive to Simon Says Stamp. I started off my tag by cutting three layers of tags using the MFT Tag Builder 6 Blueprints dies. I took the solid piece and stamped the pug wearing the Christmas pudding on to it using black ink. I then coloured the image using coloured pencils. I added a little sparkle to the holly and berry with Copic Spica pens and added white gel pen to his eyes. I added the top outside layer of the tag to this piece with foam tape to give a little dimension. 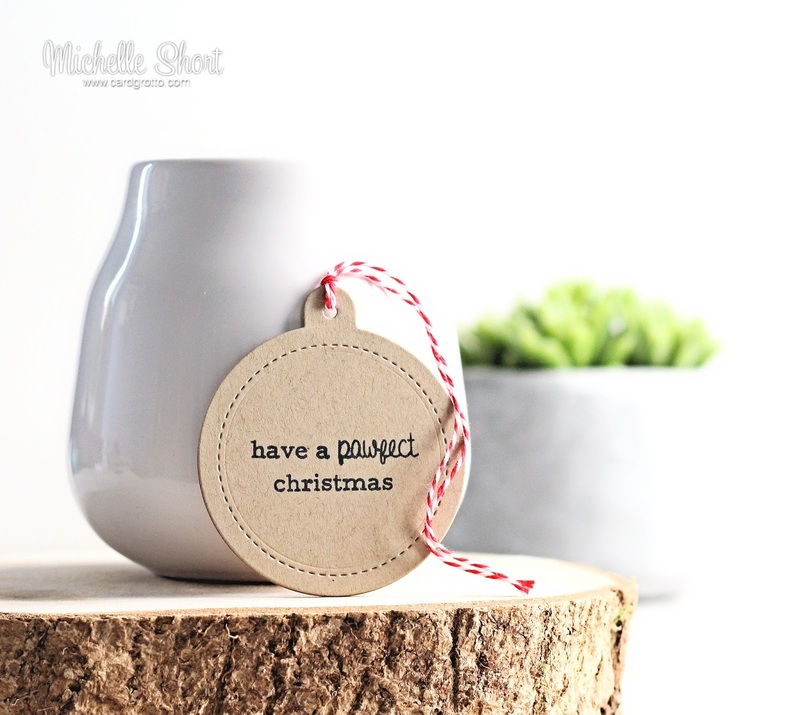 The sentiment, from the same stamp set, was stamped on to another tag and this was adhered to the front pieces. I used another tag piece instead of just the back of the tag so that you could still see the stitching detail. To finish off, I simple added Doodlebug Twine to the top. Here are the links to what I have used on the tag. Please click on the picture or wording to be taken to where I purchased it. Affiliate links are used on some products. This means that if you make a purchase after clicking on my link, I receive a small commission with no extra cost to you. I truly appreciate your support when using these links. POLYCHROMOS PENCILS: Pug - 270, 271, 272, 274, 275. Pudding - 180, 283, Derwent Coloursoft C150, 103, Holly - 112, 225. Ground - 235, 199. Shadow - Prismacolor White. Isn't the expression on his face so funny? You can tell he is not amused at being dressed up like a Christmas pudding! Thanks so much for visiting me today. I hope you have a great weekend! This is just too darn cute...love your sweet puppy tag. This is so cute, Michelle! I love how you added another tag to the back so there is stitching on both sides. Awesome! Really cute, I love it!